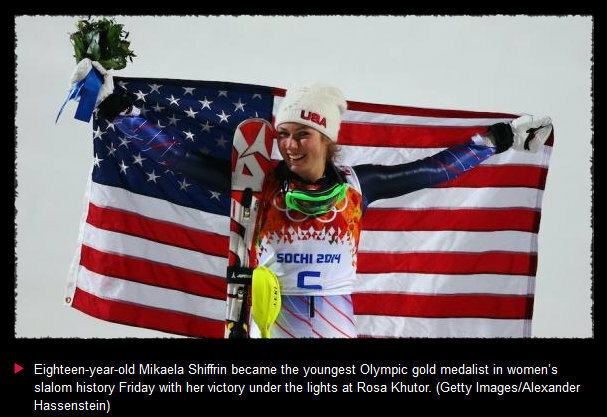 ROSA KHUTOR, Russia (Feb. 21) – Eighteen-year-old Mikaela Shiffrin (Eagle-Vail, CO) became the youngest Olympic gold medalist in women’s slalom history Friday with her victory under the lights at Rosa Khutor. The World Champion capped off the 2014 Sochi Olympic Winter Games for the women’s U.S. Alpine Ski Team with two stunning performances, giving her the first U.S. slalom victory since Phil Mahre in 1984. Marlies Schild and Kathrin Zettel of Austria skied to silver and bronze. The historic event airs Friday night on NBC’s Primetime Olympic coverage starting at 8:00 p.m. EST and can be replayed in its entirety on NBCOlympics.com. Next up, Olympic giant slalom champion Ted Ligety (Park City, UT) guns for a second medal in the men’s slalom Saturday at Rosa Khutor. 2 Responses to "Historic Slalom Gold for Shiffrin"